You can make your backyards a haven for birds, bats, butterflies and more with some easy ideas. Do one or do them all over time ... it's a beautiful thing to build a wildlife habitat. We find we no longer need any other entertainment. It's much more satisfying "chaising it" on the screened porch (lying back in the chaise and watching the show) or taking a stroll in the garden to find amazing things. What a lovely way to de-stress after a hard day's work and it's at the time when wildlife is active storing up for a good night's sleep. If you live in an apartment with a balcony or on acreage in the country, everyone can create a welcoming haven for local wildlife. You won't find yourself in front of the TV much. We canceled our reception service and no longer care about television. Here's a few ideas from Birds and Blooms list with my added comments. You can find detailed information on building a Backyard Wildlife Habitat and for $15 even get it certified with National Wildlife Federation where you can order a sign to place in your yard. It's a great hobby and certainly a great way to begin or end each day. 1. Start With Plants - look for native plants that will do double duty by provides seeds or nuts, nectar and will do double duty if you plant them densely. The more densely you plant them the more protection you'll be providing. And don't be too neat and tidy with your garden. Leaves those seeded plants alone so the birds have time to eat the seeds. 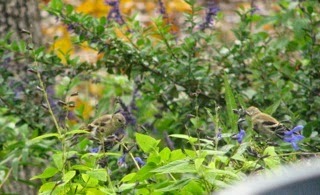 It's a delight to see the American Goldfinches eating seeds in our garden. 2. Give Extra Attention to Shrubs - If you've got a lawn with bushes spaced apart it doesn't provide much shelter for wildlife, but you can connect the shrubs to patches of wildflowers or more food-producing shrubs. This provides a living fence that can be used as a hiding place. 3. Leave The Dead Trees - Dead and dying trees called snags are very important, so if they're not a threat to the house, leave them alone. As they decay they lose branches and cavities form. Add to that the holes woodpeckers excavate and you could have all sorts of animals taking up residence. 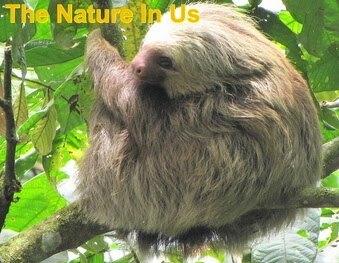 You also attract bug eating birds which means your other trees are more likely to avoid infestations. If you have neighbors who cut a tree down, ask if you can saw some "sitting stools" out of the trunk. Place them around your yard where you'd want to have a view for watching wildlife. As they rot, the lizards love to use the for escape caves while they peer back out at me as if they're saying, "Nah, nah, nah, nah, nah." 4. Make A Brush Pile - Build them by lining up a series of parallel logs, and then layering smaller branches on top. This gives you a domelike structure filled with space that wildlife such as foxes or a mourning cloak butterfly will take advantage of. We've had rabbits and turtles in ours and birds nesting in them in Spring. 5. Pile Up The Rocks - Do the same thing with rocks stacking smaller stone on and around bigger ones to create mini-caves and crevices. 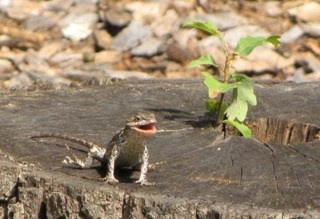 Our lizards and skinks here love these! 6. Put Up A Roosting Box - You can buy or build these. A roosting box differs from a birdhouse in that the hole is at the bottom so the heat can rise and remain in the box. Along the sides you can use dowel rods for sleeping perches. You'll find that tree frogs even like these. You can also provide a place for winter rest in your birdhouses by cleaning them out in the Fall, spraying them with some essential oil blend to kill any lice or whatever, and then place some pine straw or crushed leaves in to keep them warm. 7. Support The Bat Population - Bats will help you control pests and do a lot of work for you. These little flying mammals are a delight to have around at sunset when they come out and begin their busy night of bug-eating. Study to find out what kind of bats inhabit your area. We built a bat house only to find that the Little Brown Bat is what we have in our area and they like to roost in trees. Being that our home is on a wooded acre, they didn't need supplemental housing.